﻿ Dekuta Hotel, Bali | FROM $20 - SAVE ON AGODA! "The staff at the hotel and at its restaurant were fantastic..."
Have a question for Dekuta Hotel? "Overall this hotel good for price." "The redeeming features were the warm clean pool and the breakfast." "Location is strategic and staffs are very welcoming and friendly." "Nice boutique hotel with great view and swimming pool." 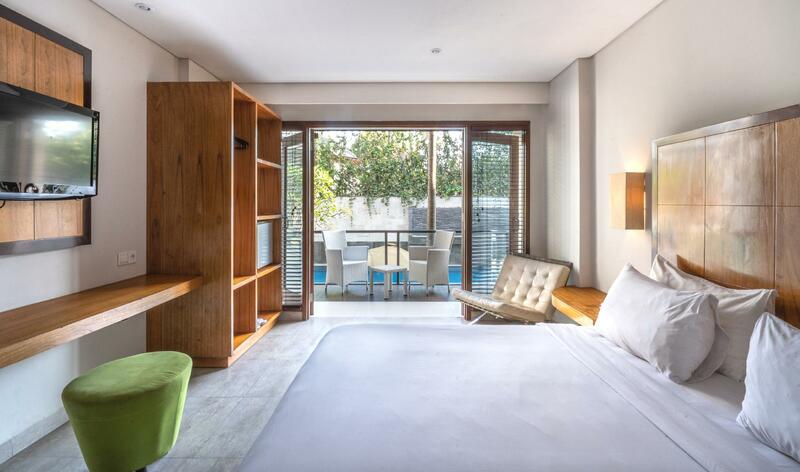 This ultra chic and stylish property sits just steps away from the famous Kuta Beach. 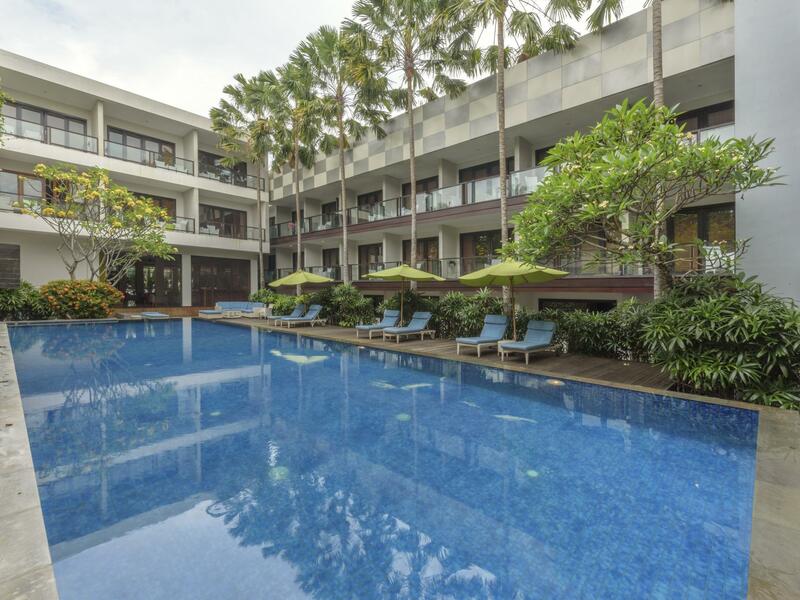 Featuring an extraordinary personality, Dekuta Hotel is ideal for couples, explorers, shoppers, and family alike. 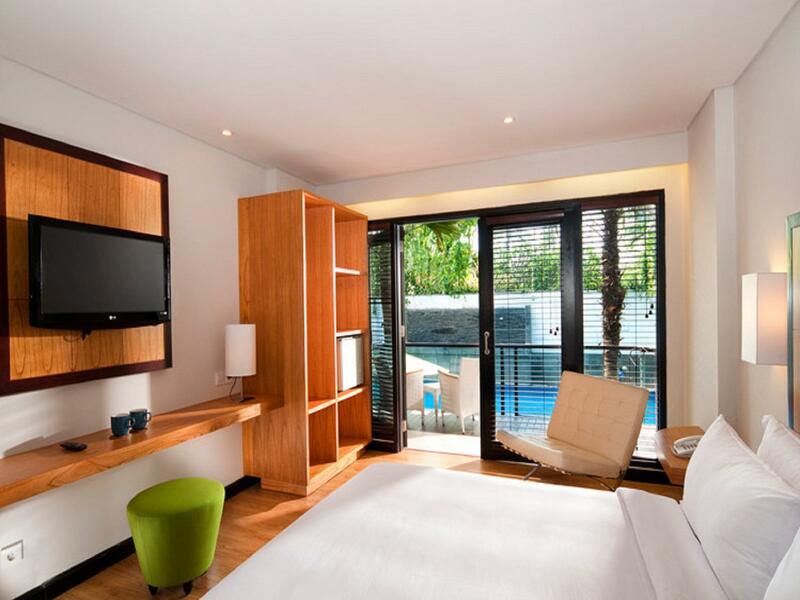 A perfect place for a getaway, Dekuta Hotel boasts 54 modern and charming rooms with mahogany wood flooring. This modish boutique hotel also features excellent facilities including internet access, 32'' LCD TV, coffee & tea making facilities, safety box, rain shower and bathtub for your comfort. Dekuta Hotel sits on a perfect spot in Bali. Guests can experience outdoor activities like rafting, mountain cycling, hiking, bungee jumping, and water activities. All things considered, Dekuta Hotel offers a fun place of stay! "Pool is great + location awesome with regards to the beach,..."
Guests must present an identification card or passport upon check-in to qualify for the domestic residents rate promotion. Please be informed that Bali island celebrates Nyepi (Silent) Day each year on below dates. The Nyepi (Silent) Day is a day of absolute silence throughout the island. No outdoor activities are allowed including check in and check out from hotels. Everything was great.. the price, location, cleanliness and even the staff is very helpful.. Only one thing that really upsets me the AC unit.. please get a f**king new AC unit.. told them to fix the AC unit.. then there is a guy came to check on it, said lack of freon.. but.. til my last days staying.. still no cool air.. have to stand or sit on the chair.. to feel the cool air.. rather than laying on the bed.. This is a very nice hotel located just off the beaten path but a short walk to the beach or up Poppy's 2 and even to the Legian nightclubs. The hotel is on Papi's to Street next to the beach Mall and a nice easy walk down to the beach. There's some good restaurants right next door and of course you can walk to anywhere in that section of kuta there's tons of really good restaurants with some of my favorites being Poppies restaurant and Warung Indonesia. The they have nice size rooms with big comfortable beds and a really nice balcony that overlooks the pool. This has become one of my two favorites along with j4 Hotel in the kuta area. Both hotels have great customer service, are very clean and great values. Dekuta Hotel is closer to the beach which gives it an added perk. -prefect location to kuta beach (about 5minutes) and short cut way to legian (poppies lane II), near to beachwalk mall, hardrock cafe... -staff was good and friendly -the nebula cafe not halal i think -toilet quite smelly and i saw a little cockroach in the sink... -overall this hotel good for price..
A/C in the room was not working properly and obviously needed cleaning. While it still worked, I woke up on my last day with a wet bedroom floor. I saw in earlier reviews the same A/C concern. I hope management will have routine A/C checkups/cleaning to avoid similar concern from future guests. Stayed here 4 nights. It a really nice 3-star hotel with minimal frills but their hospitality is second to none. Staff was absolutely friendly, especially front desk personnel Mr. Agus who was very helpful. We stayed in room 304. Just a little concern that our sheets and pillow case was dirty and not being replaced. Highlighted it and it was immediately actioned right away by our housekeeping personnel in charge of our floor Mr. Dewa. Mr. Dewa was very obliging in our little requests for little things for the room. Water pressure from shower was good and there was consistent hot water. Air conditioning was working and colder than expected. Breakfast was ala-carte and decent portions but very nice at their cafe Nebula downstairs and it was lovely. Hotel location was good and there's an Asian restaurant called Fat Chow just next door. Overall I would say this is a good place for a break without paying the extras and having excellent hospitality. Thanx Agus and Dewa. Already missing Bali. I book for 7-8 and change to 9-10 and dekuta help me to change that although i buy a non change date..best! the location was so accessible! the staff was so welcome and friendly. however, the room was infested with mosquito due to the rain. the rooms are a bit dark and towels are old, basin were rusty too. If not for the amazing service from the staff, I dont think I would enjoy my stay. good job! Since this trip main agenda my husband's to learn surfing, so we decided to find hotel that is close to kuta/seminyak beach. It is located right behind the famous beach walk mall of kuta. Its about 3min walk to kuta beach. We normally prefer to stay around Uluwatu,Bingin or Ungasan area. So we first encounter Dekuta was when we stayed here a night as transit hotel before flying home the next day. As far as price is concern, it is by far the cheapest we paid so far. All the rooms are wit balcony that is facing the pool. Because of its strategic n convenient location, thrs no need to worry about food or grabing ride to go anywhr. In fact there's 2 well known chain restaurants (Nebula and fat chow) connected to this hotel. Breakfast is serve at nebula. Nebula is well known for their bowl of heaven (smoothie). For the price we paid, we honestly think it's more thn what we were expecting. I personally find the room is spacious enough for us two. Most importantly the room and hotel compound is clean and tidy, and the toilet does not stinks. Overall, I am giving them best of the best for a 3star hotel in bali. Hotel has everything i am after when traveling solo and is close to all the night life. Staff is nice and rooms are always clean and have a good rate. No noise issues at all. Have stayed here 3 times now and cant complain with anything at all. Only thing its missing is a gym ! Our room has a great view over the pool. The air-con broke down the first night of our stay and we could not sleep. AC is a must in Bali! They were kind to offer us another available room. The floor looks quite old and there was scratches. The location is super convenient with mini mart, mcdonal, kfc, local food in walking distance as well as the beach. The staffs are very friendly and helpful. You can rent a bike here, request uber pickup. I would stay here again. Hotel is relatively new, and right smack in the middle of Kuta, 2 mins walk to Kuta Beach and the Beachwalk mall, 6-8 mins walk to Legian St. (the party central), Hotel rooms are big, clean and very minimalist, bed and pillows are comfy enough and satisfactory, WiFi works well. If you are booking a higher floor please note that there's no lift. However the room I booked had no Kettle, No Coffee or Tea provided, No curtains (only blinds), Shower had no shower curtain either, you probably can ask them to provide these, which I didn't bother. Food at Nebula cafe beside the lobby is good (except the breakfast, which is pretty ordinary), good atmosphere as well especially on the roof top. Pool is clean, staff is friendly. Despite the shortcomings I'd book this hotel again.